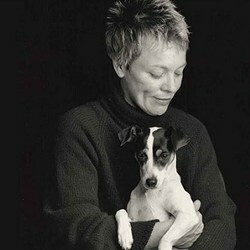 Lolabelle was Laurie Anderson’s beloved rat terrier. “Hello, little bonehead. I’ll love you forever,” is how she greets the puppy in the movie’s hilarious first scene in which she gives birth to her dog. Dreams, memories, and stories of childhood trauma and loss form a kind of emotional wallpaper against which Anderson foregrounds her story. The musician/composer/poet/philosopher creates a humorous, deeply moving meditation on the relationship of woman and dog, and in the process comments with wit and prescience on the changes in post-9/11 America. Rat terriers are bred to protect borders, but Lolabelle not only engages in the kind of surveillance the filmmaker notes proliferating everywhere, but also plays experimental piano and paints. “Every love story is a ghost story,” Anderson quotes David Foster Wallace, as she illuminates the Buddhist concept of the afterlife (the bardo). HEART OF A DOG employs an original, hypnotic visual language that embraces animation, home movies, and loop-like images, complemented by Anderson’s signature music.